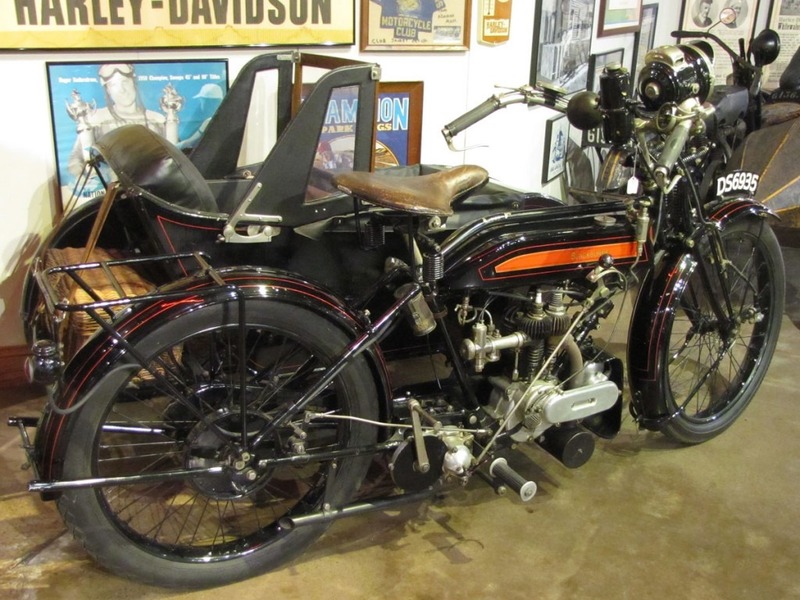 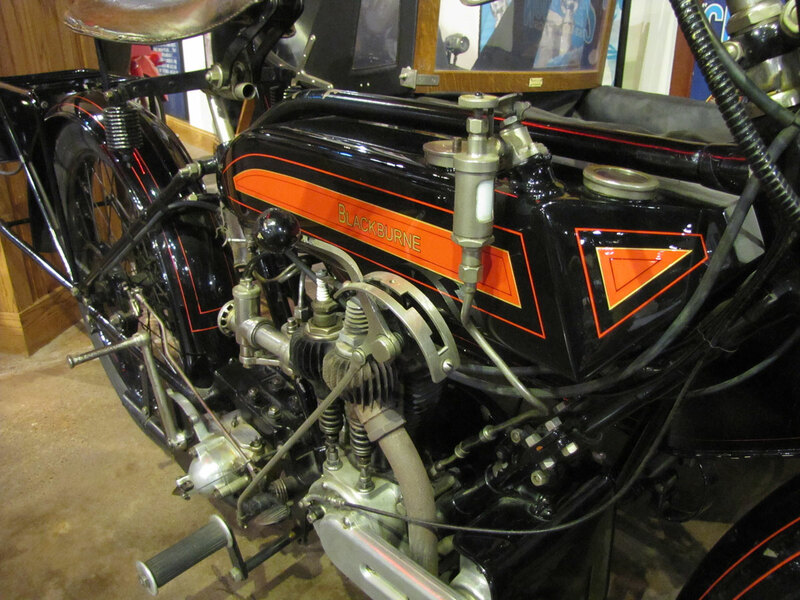 The Burney brothers founded Blackburne Motor Cycle in Birmingham, England around 1913. 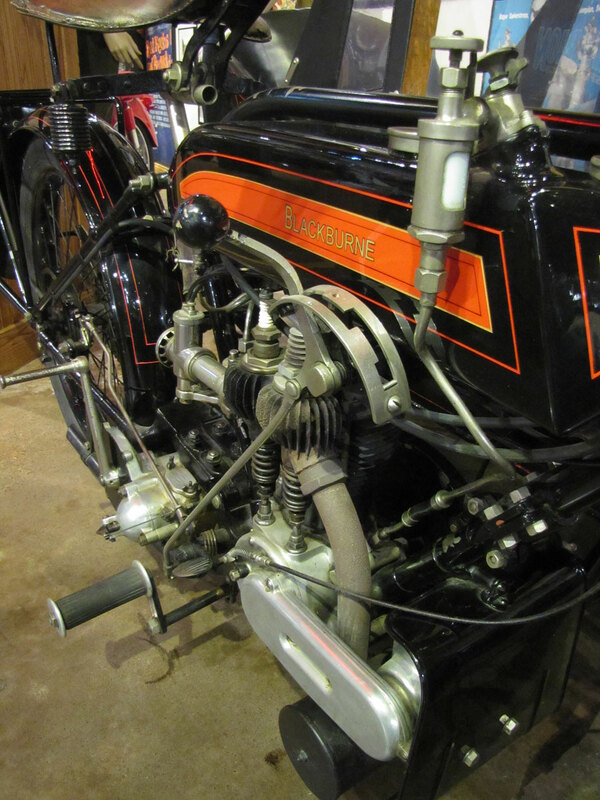 They also specialized in engines which they continued to make and supply to other motorcycle and cycle car manufacturers until about 1937. 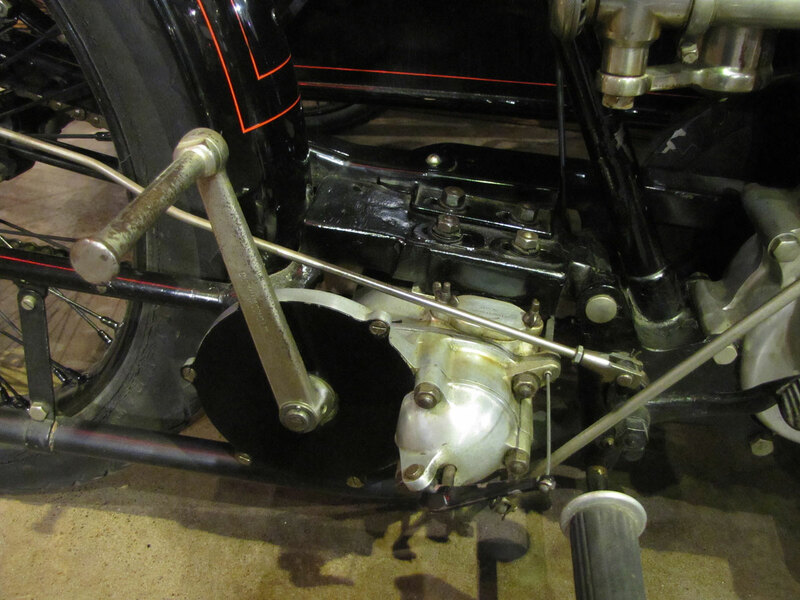 Built in 1921 this is a relatively sophisticated sidecar rig. 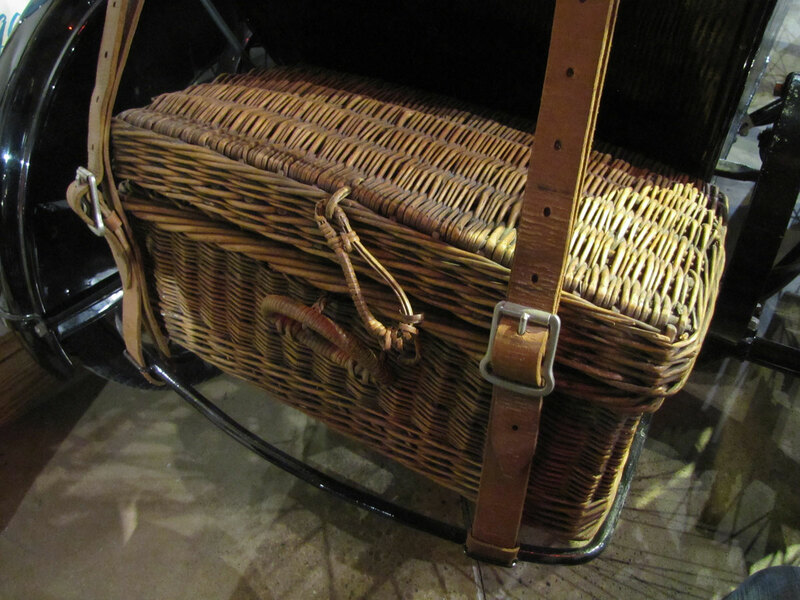 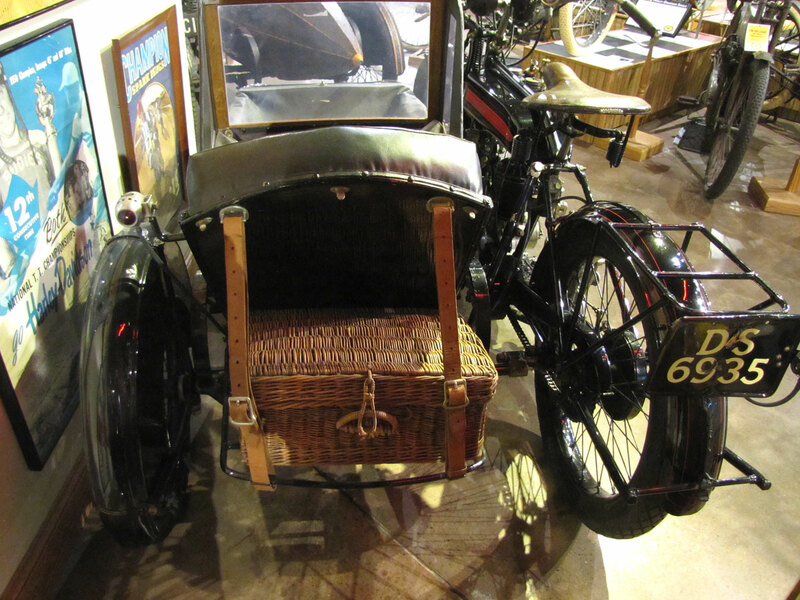 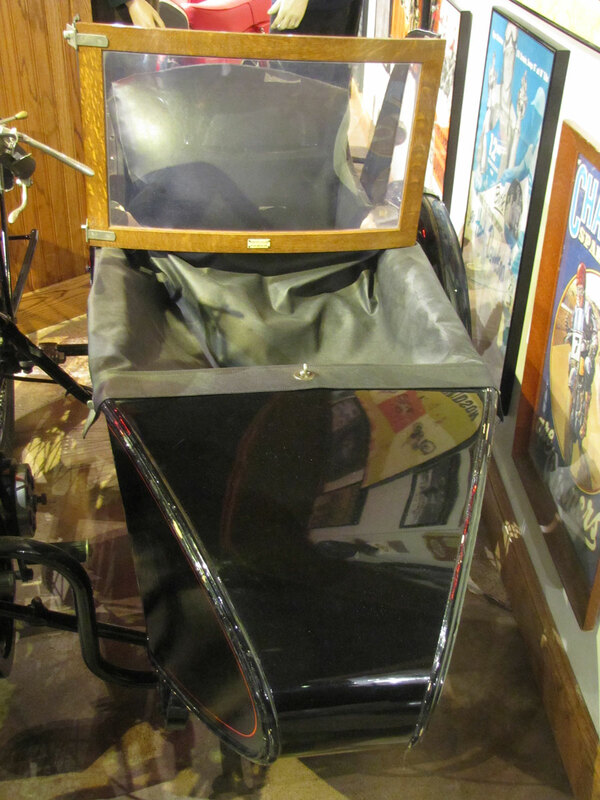 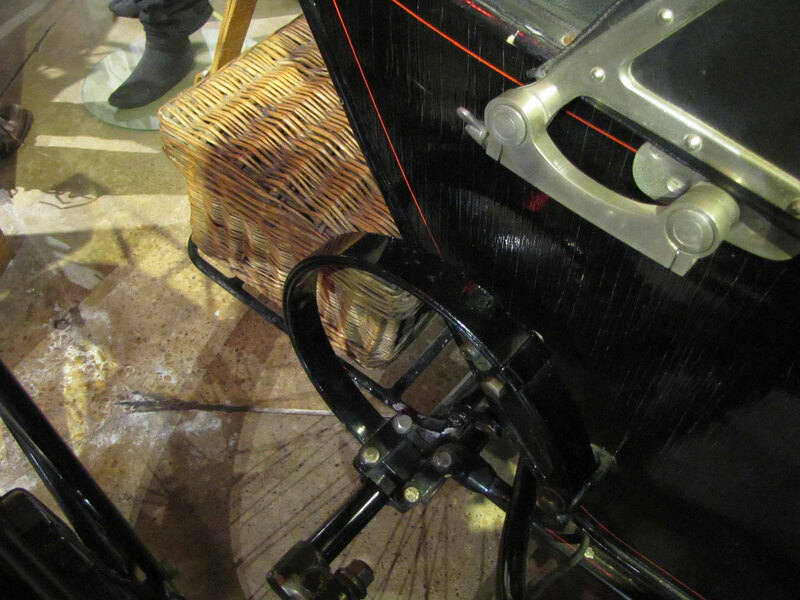 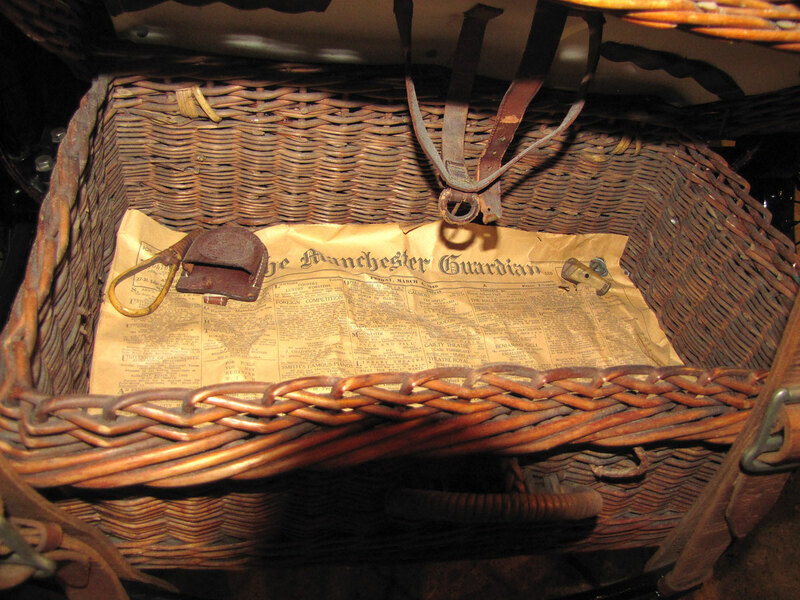 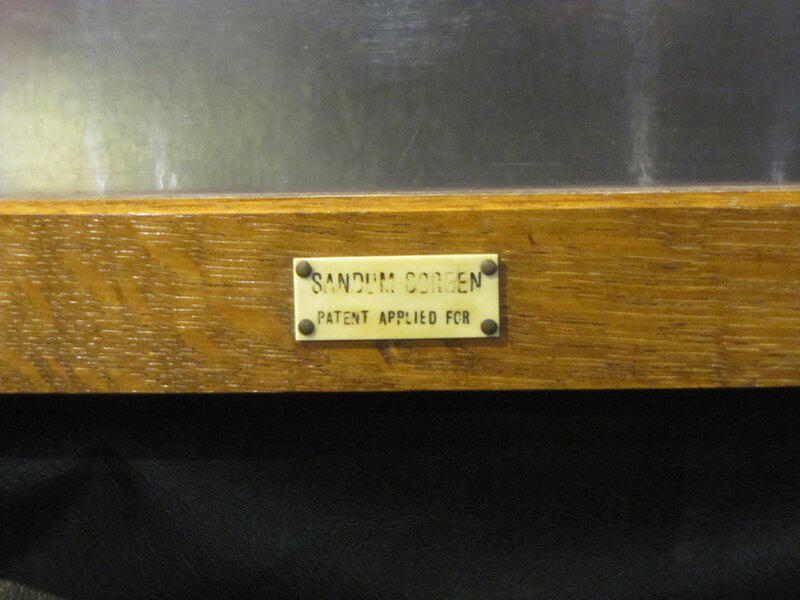 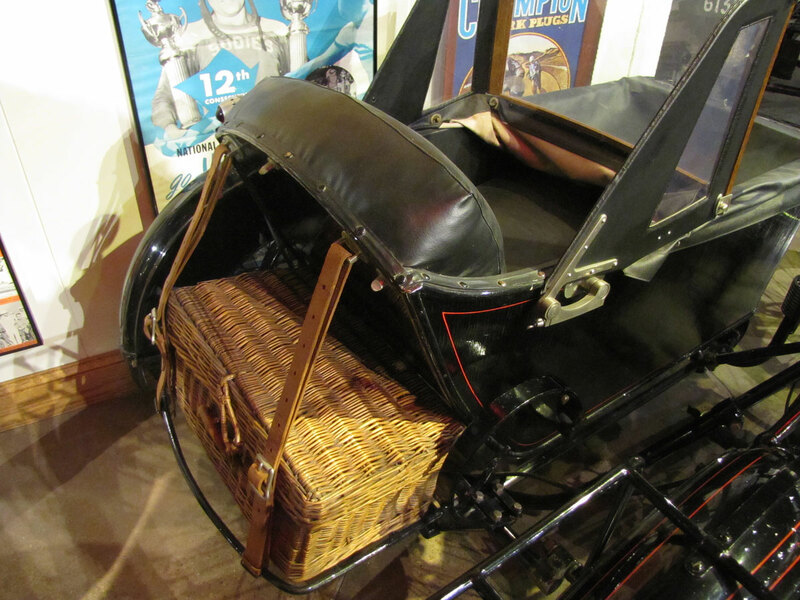 Note that the Sandum Corben sidecar has a wood framed windscreen and a wicker trunk attached at the rear. 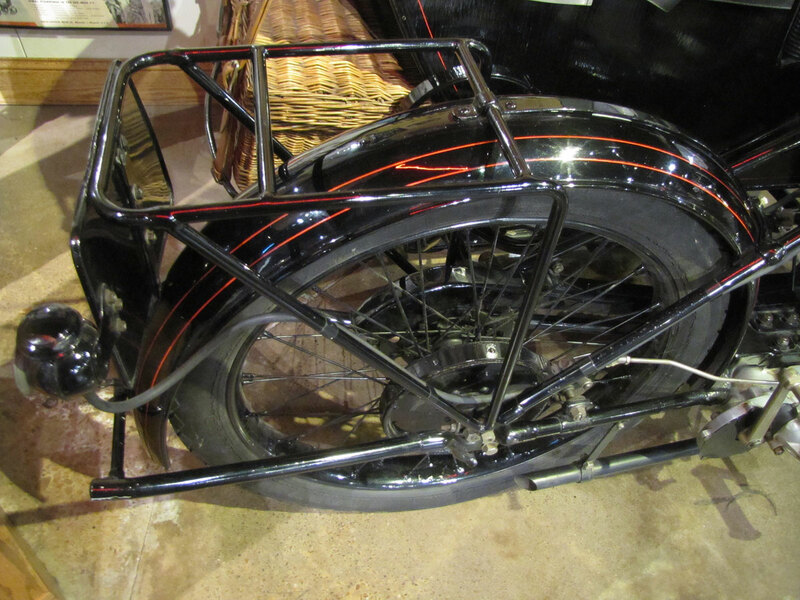 They were a big sidecar manufacturer in England and even made sidecars for bicycles. 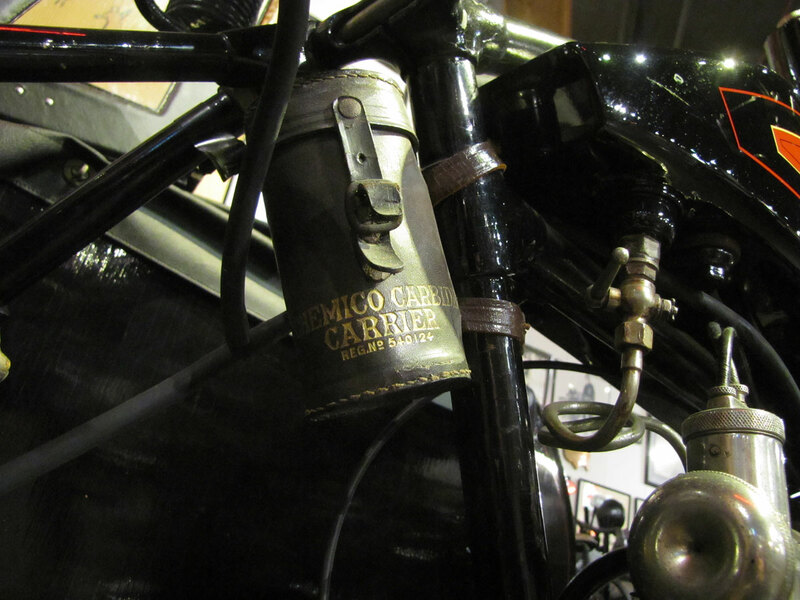 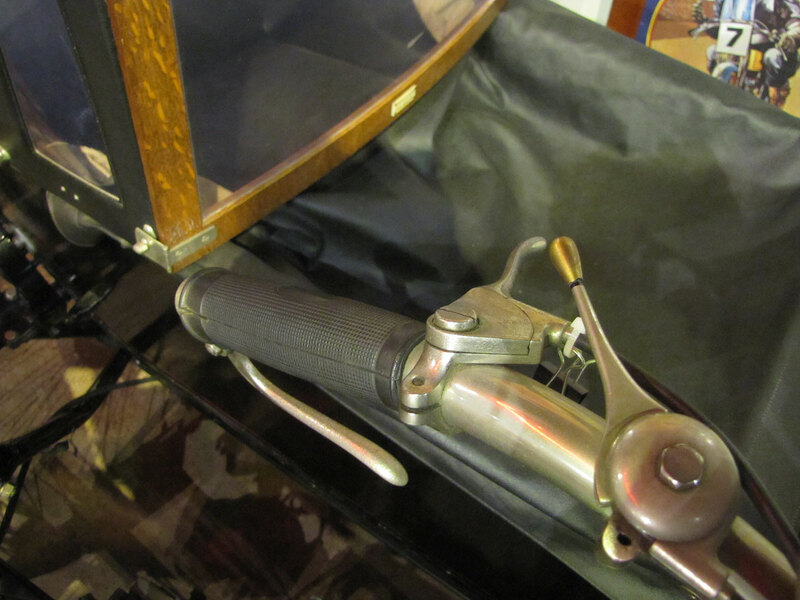 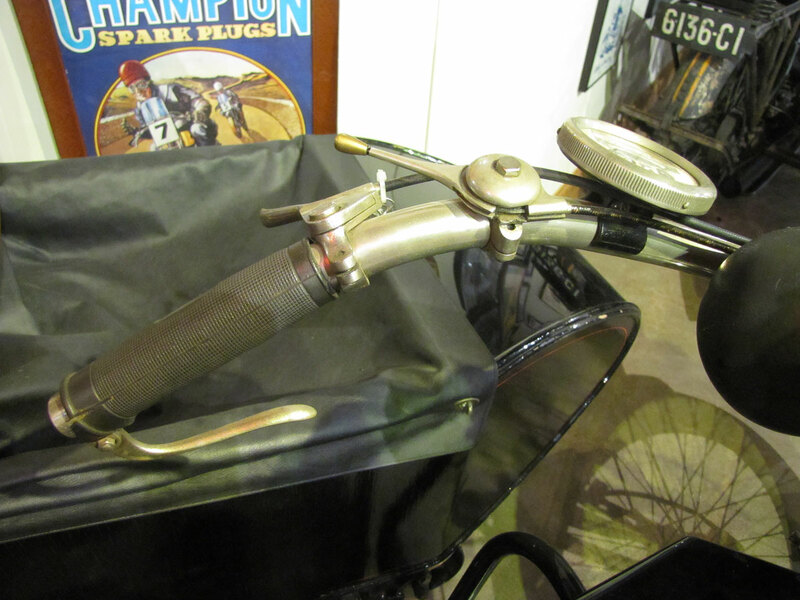 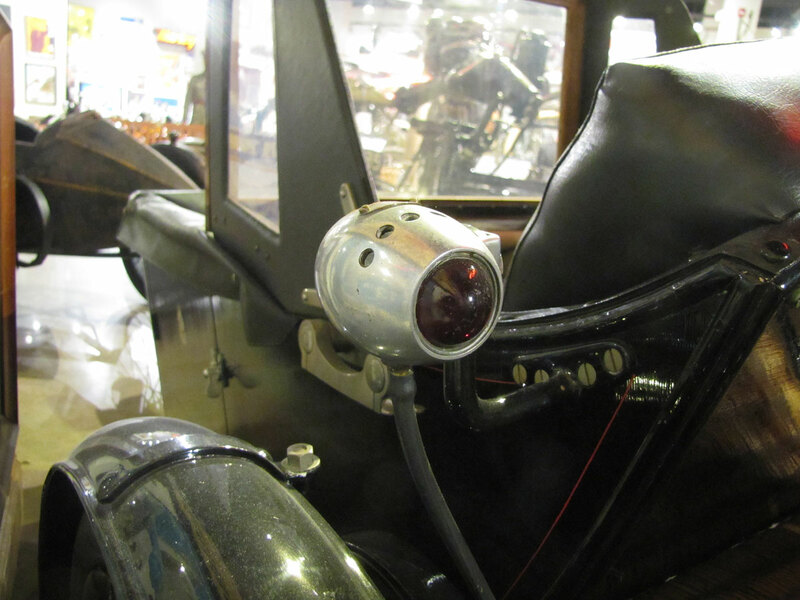 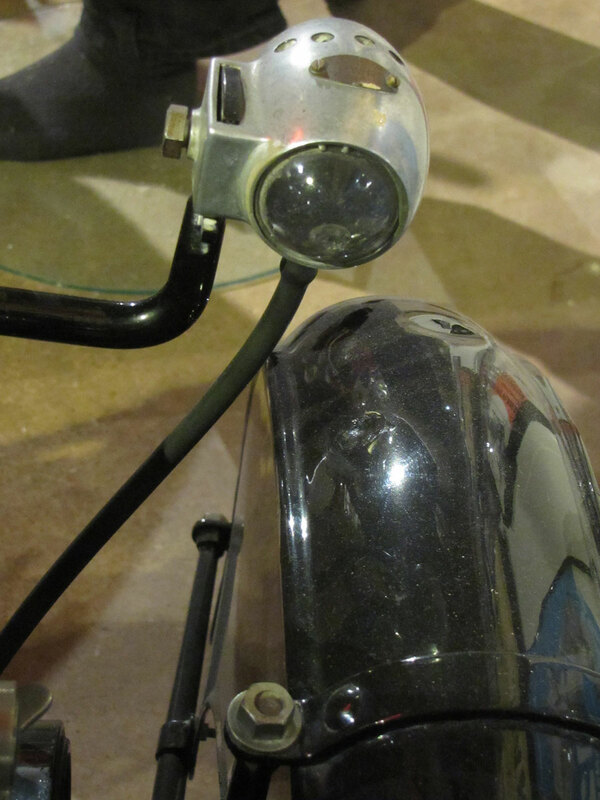 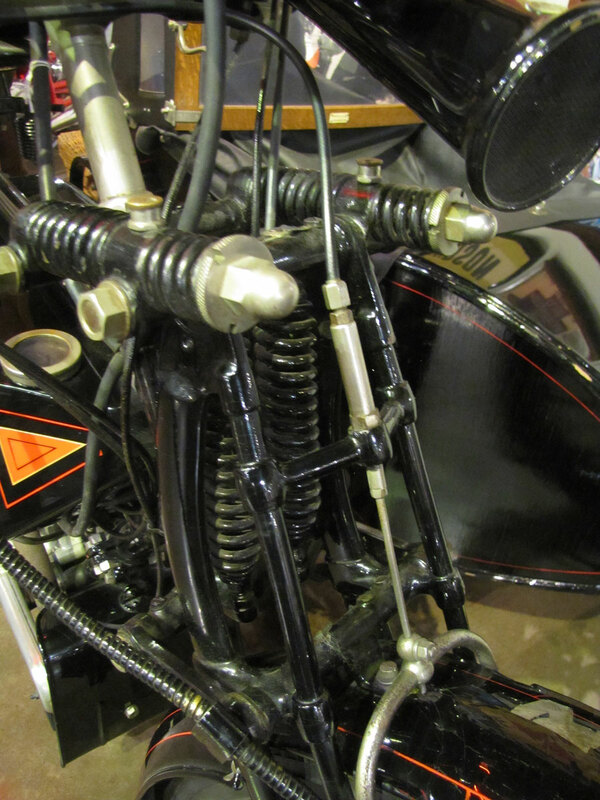 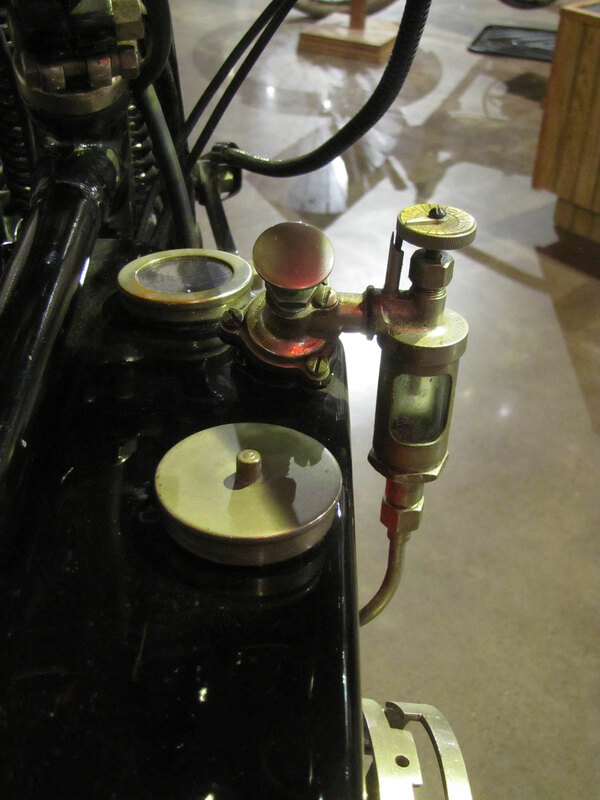 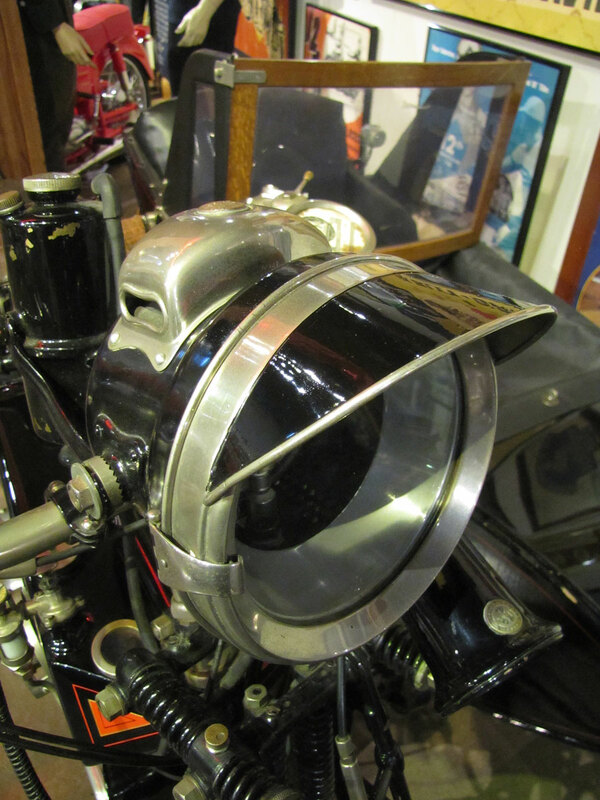 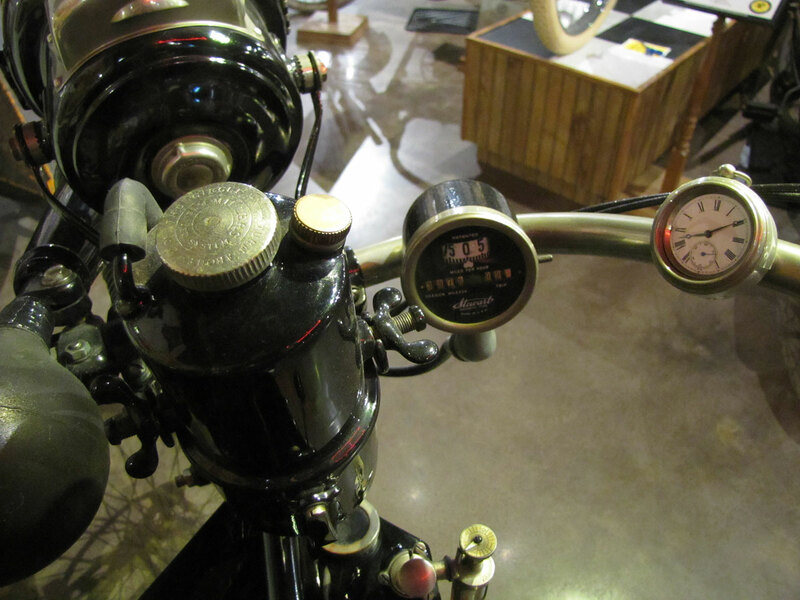 An acetylene lighting kit has been installed, a front wheel-driven Stewart speedometer and a clock are attached to the handlebar and there is a handsome bulb type horn. 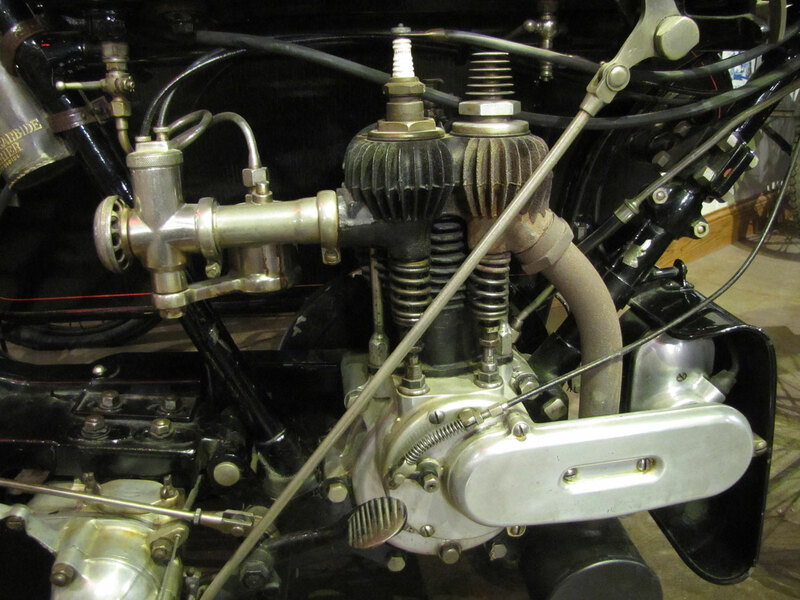 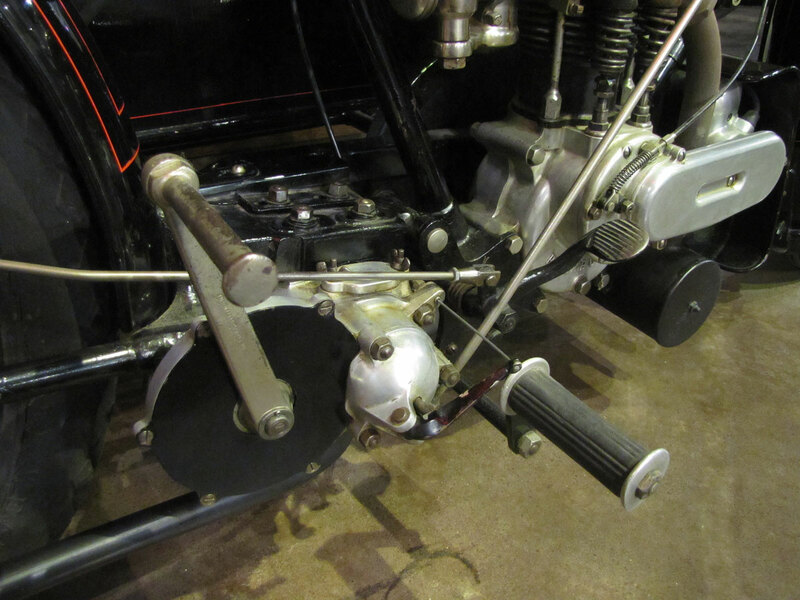 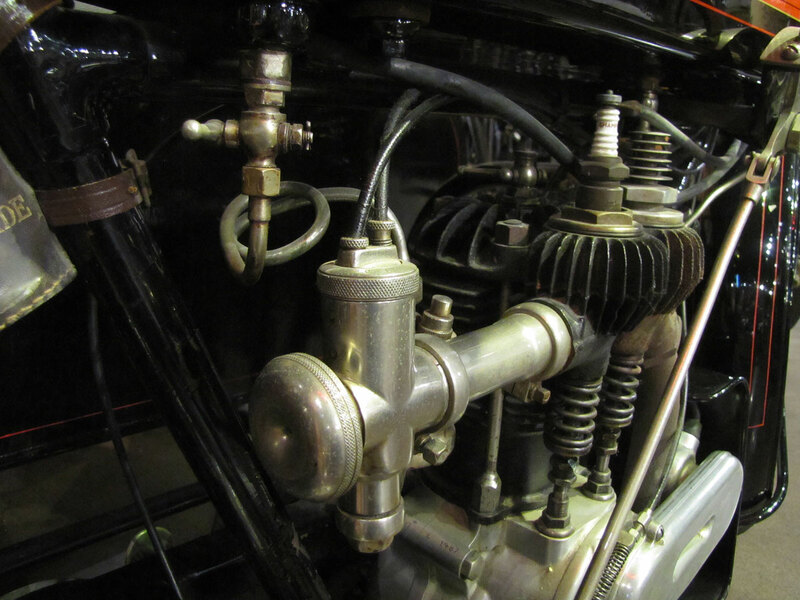 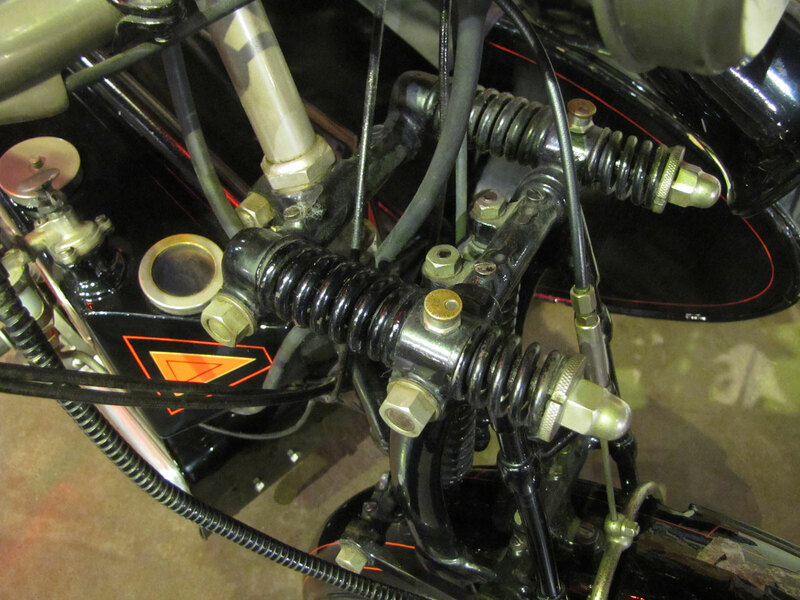 Basic in design is the side-valve single cylinder engine with an exposed flywheel and clutch, but the cylinder and head are cast as part of the upper crankcase, half reducing the need for gaskets. 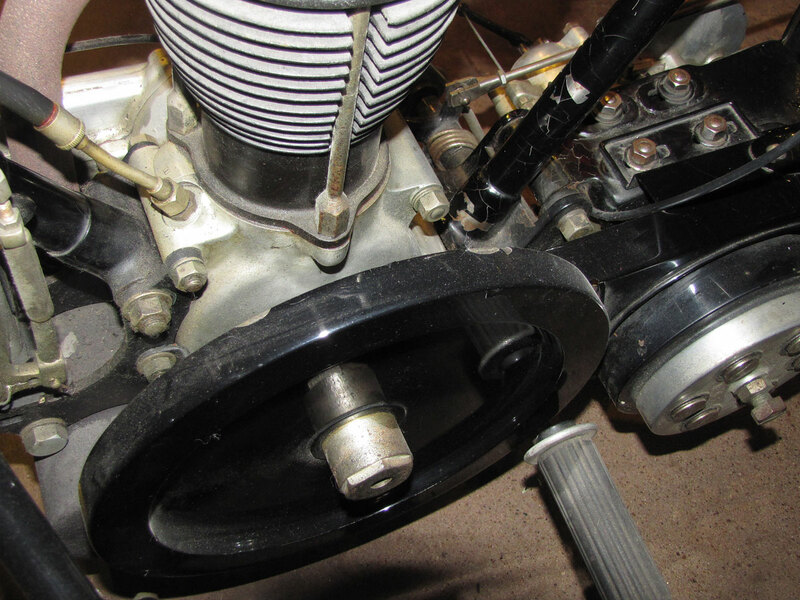 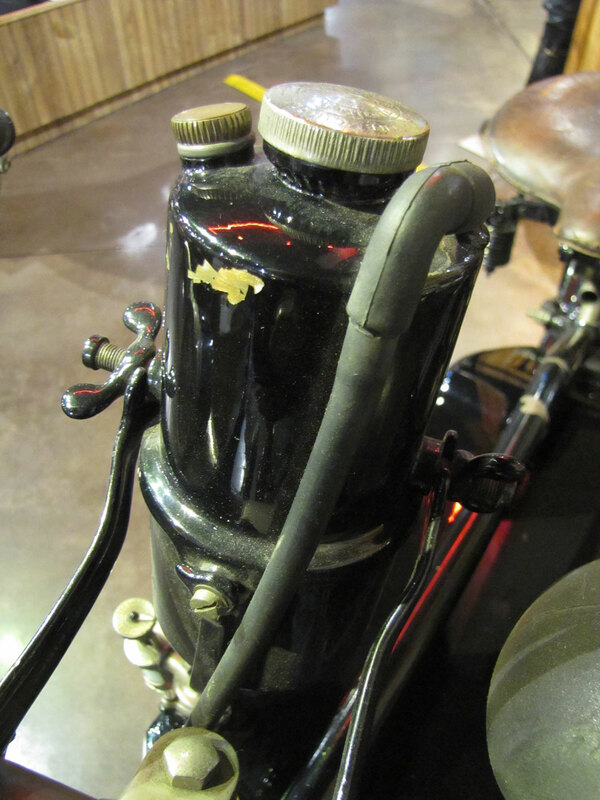 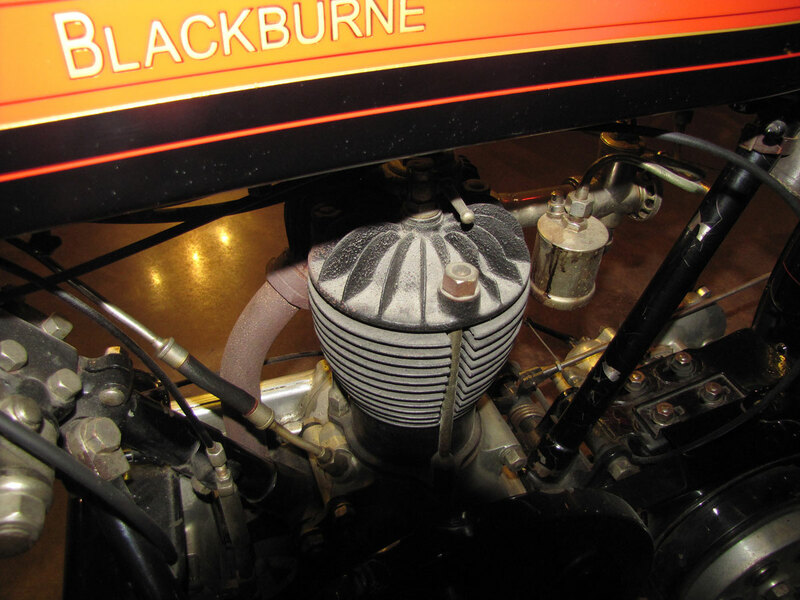 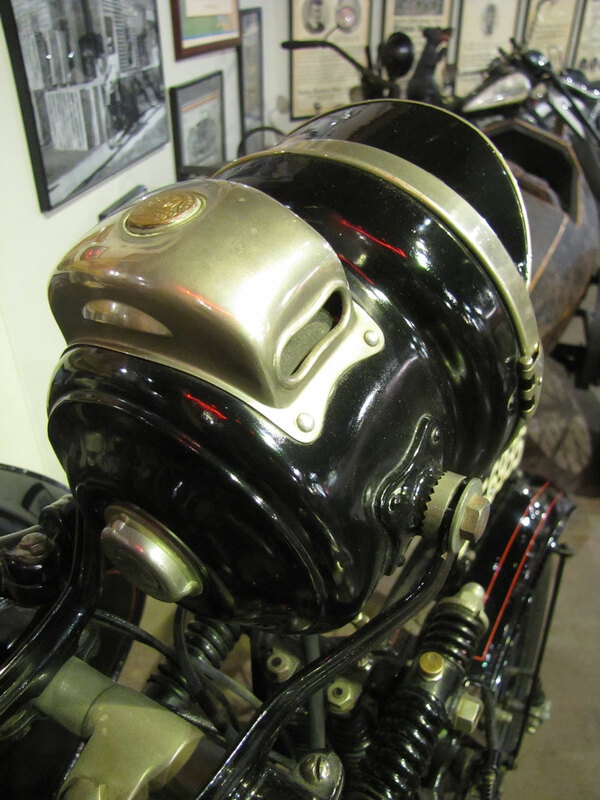 Note the carburetor’s intake cover designed to deflect stones and other foreign matter from entering the engine. 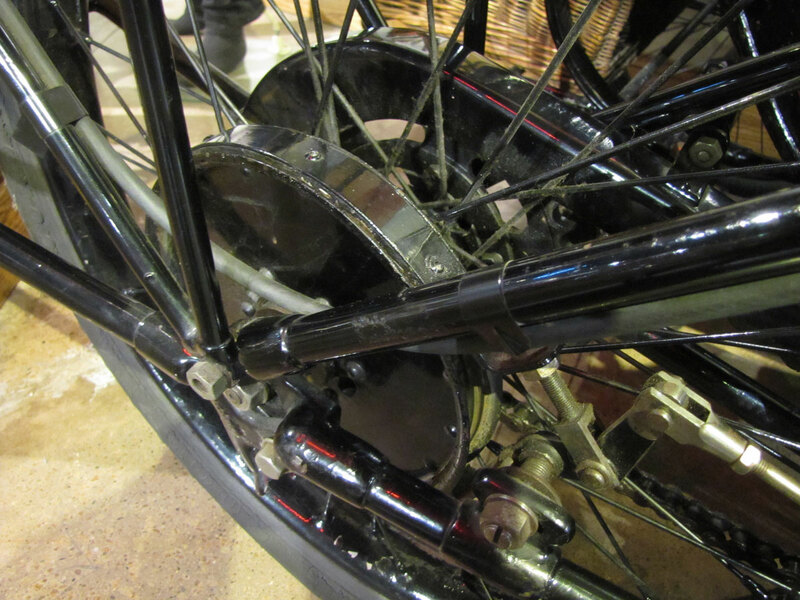 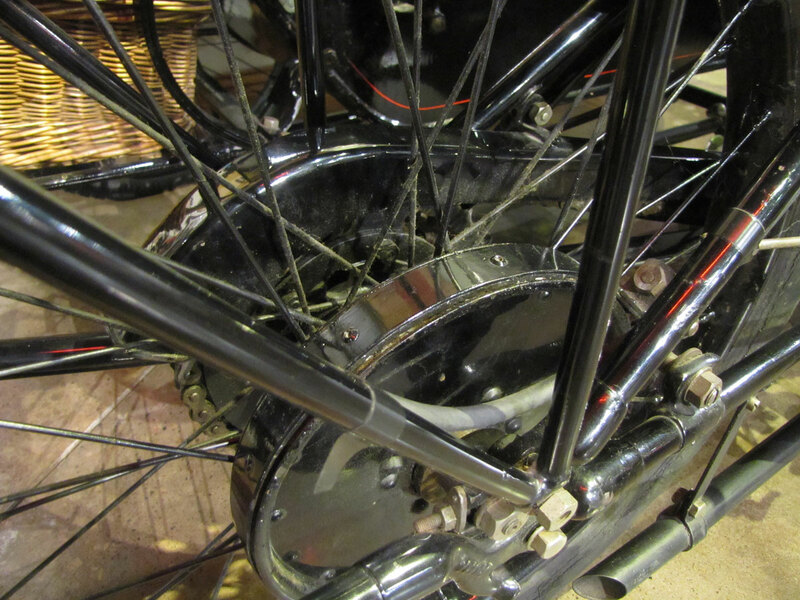 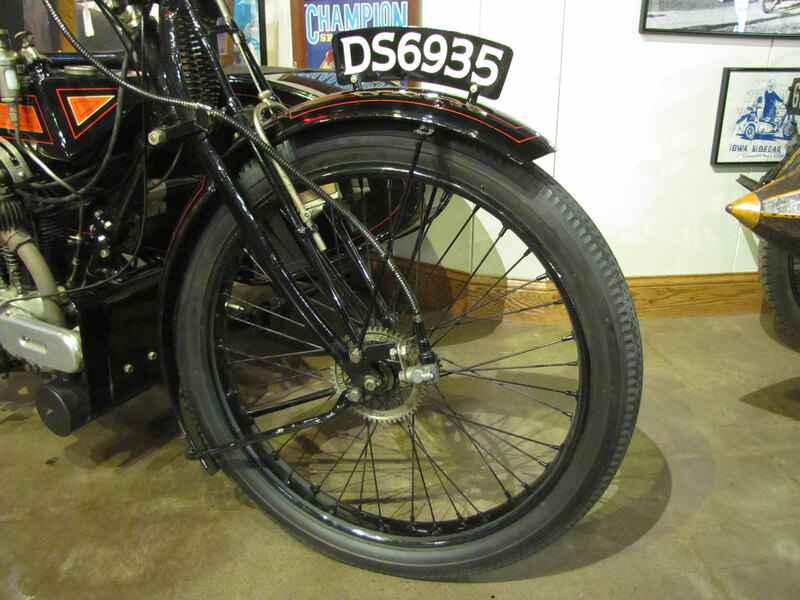 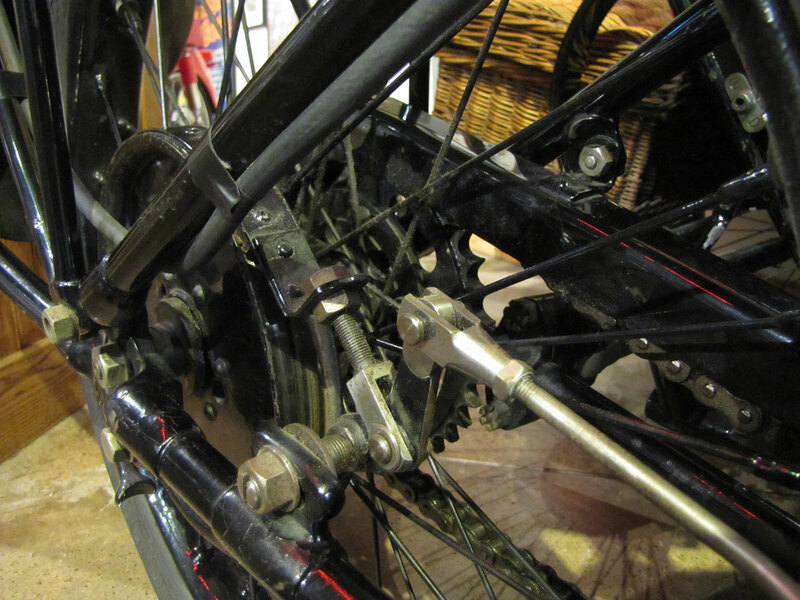 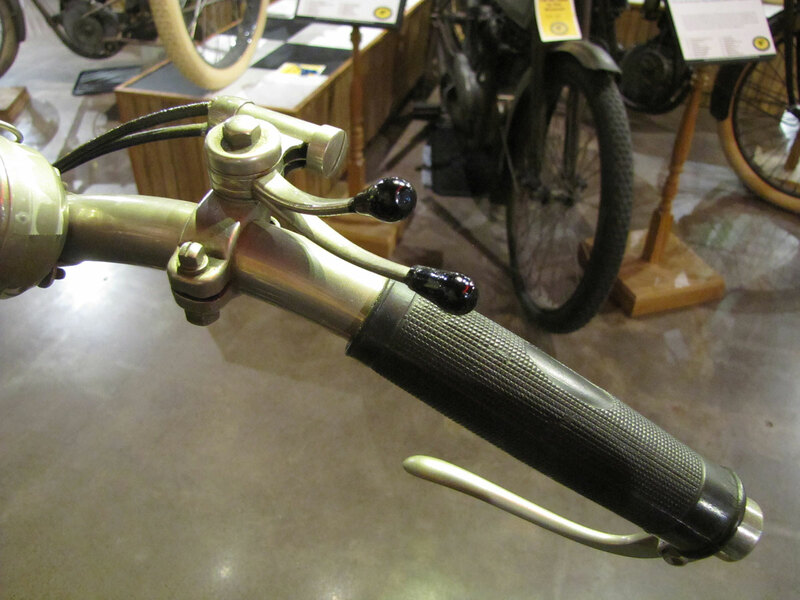 In a period when a variety of brake designs were tested, including an interesting disc/caliper set-up on the British Douglas make, these front brakes act on the front wheel rim more like an English bicycle. 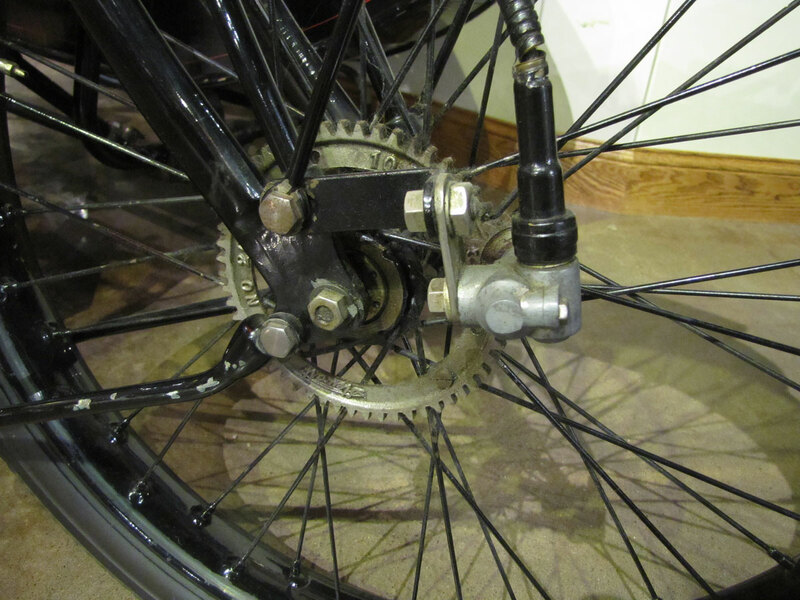 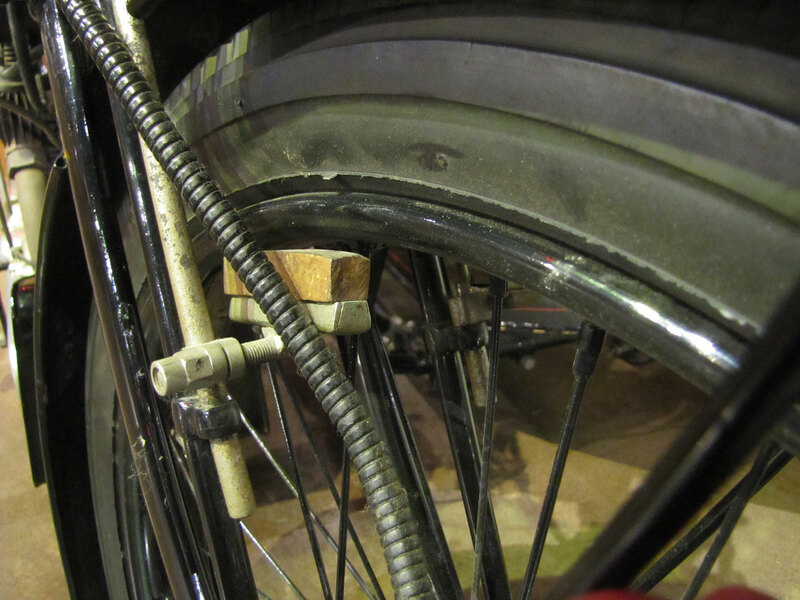 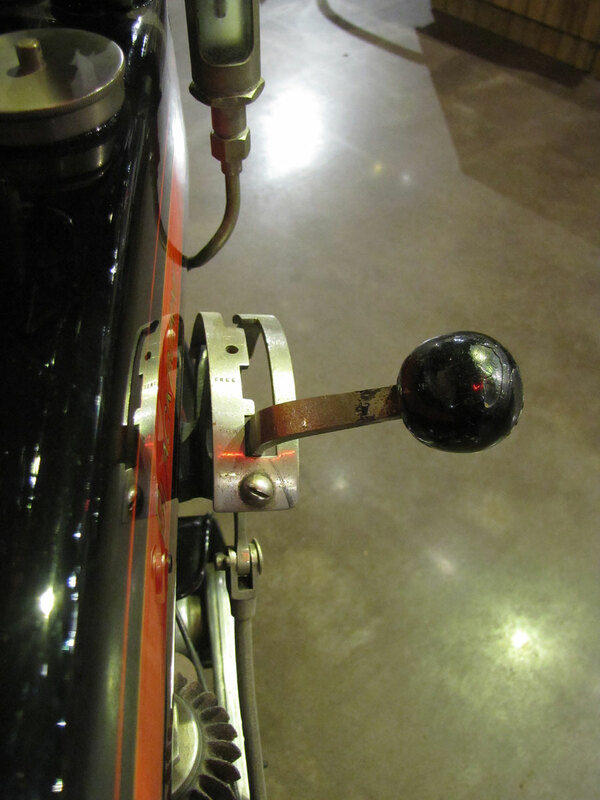 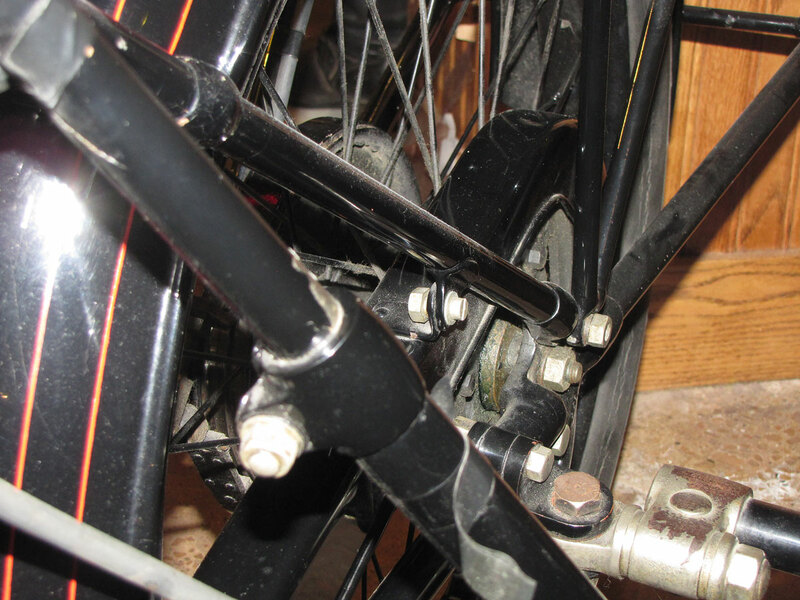 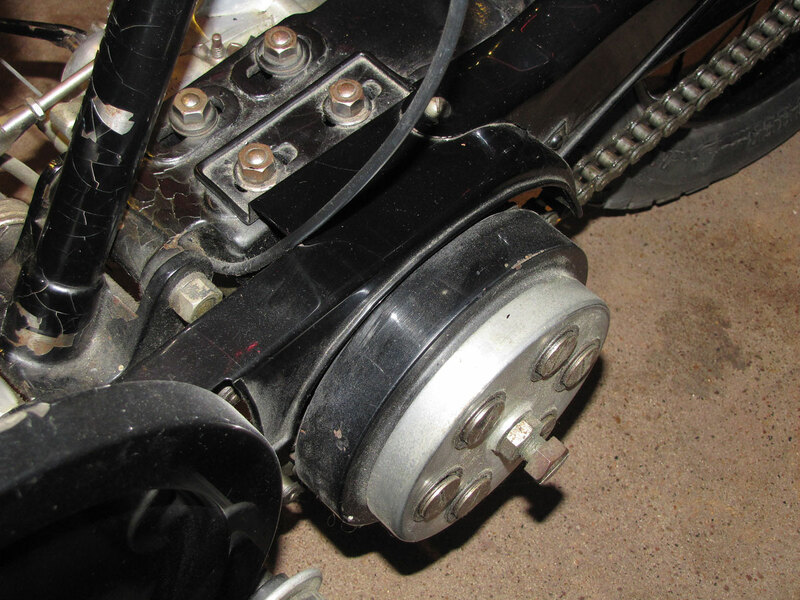 The rear brake is an innovative V-shoe brake. 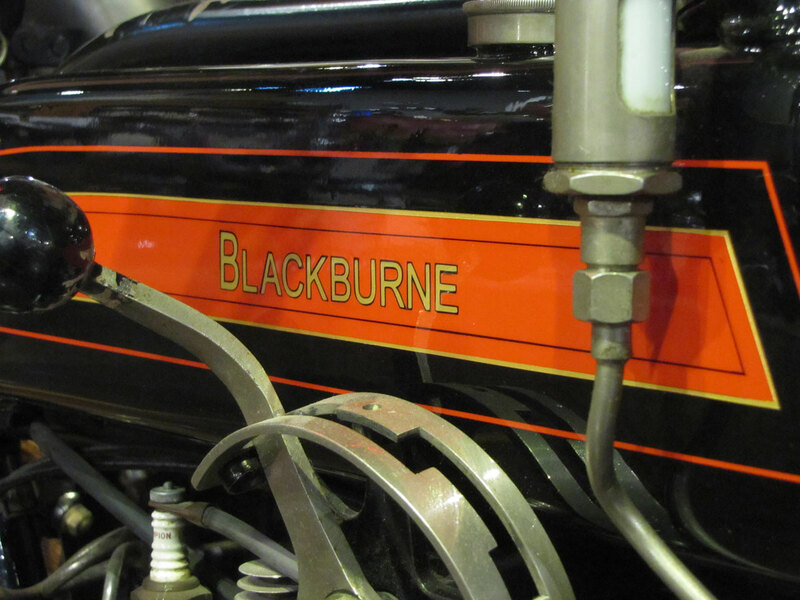 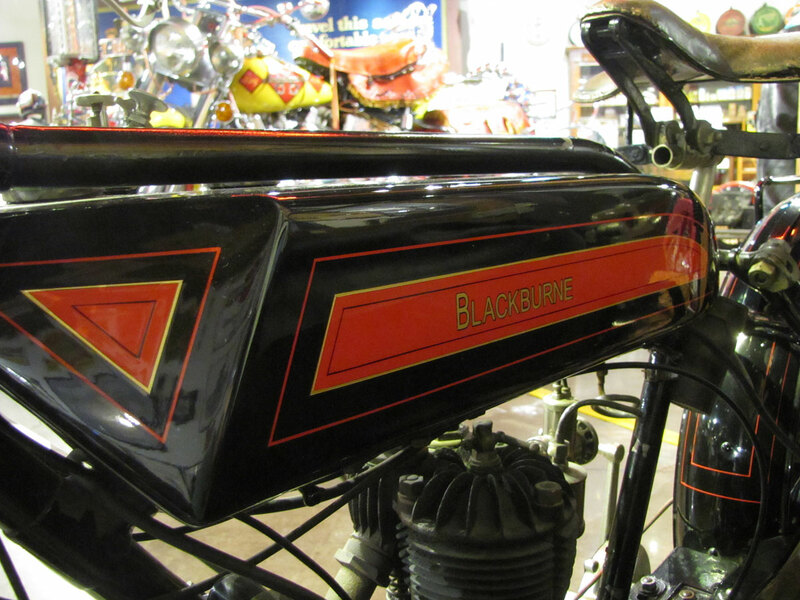 The trade name Blackburne was created by Cecil and Alec Burney who manufactured motorcycles from 1913 to 1922 under that name. 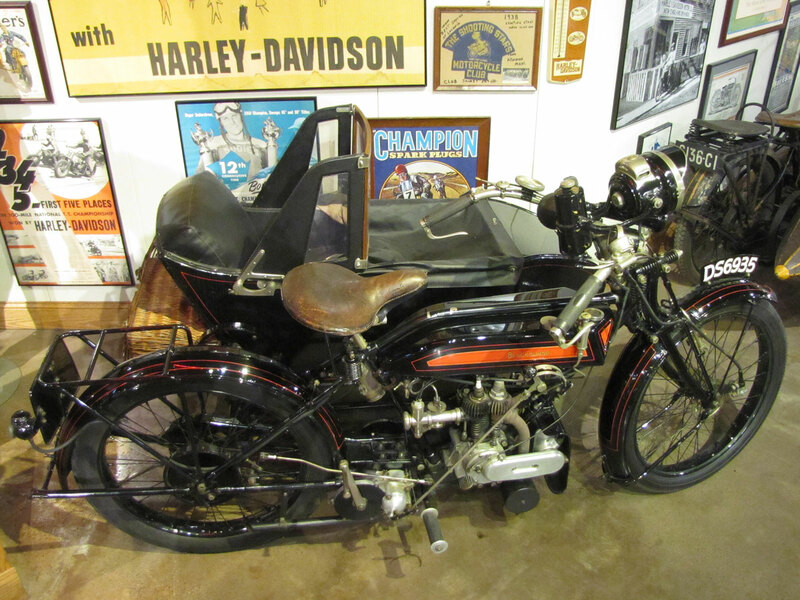 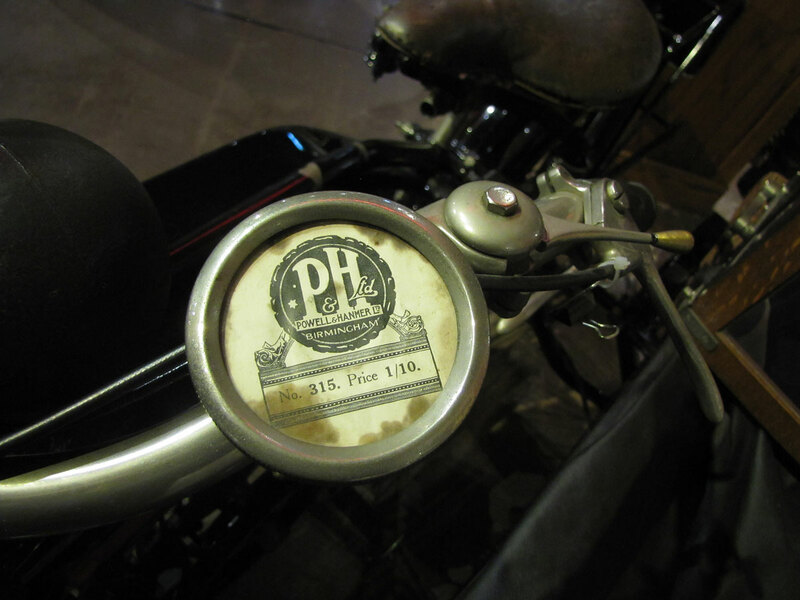 The company stopped making motorcycles in 1922 and focused on aircraft and other engine design and manufacture. 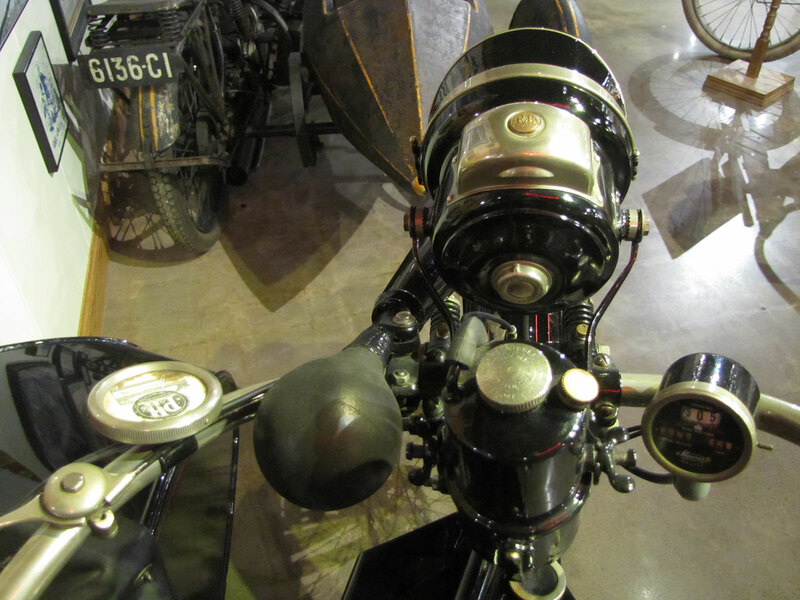 Being of exceptionally high technical ability, the Burney brothers served in World War I riding motorcycles while testing their designs. 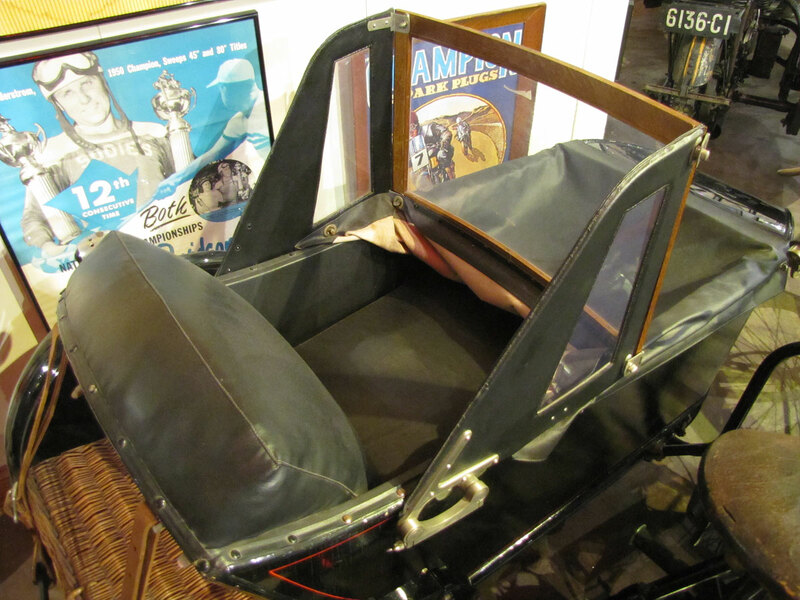 In the early part of the 20th Century, before cars like the Model T became inexpensive, sidecars served as family transportation. 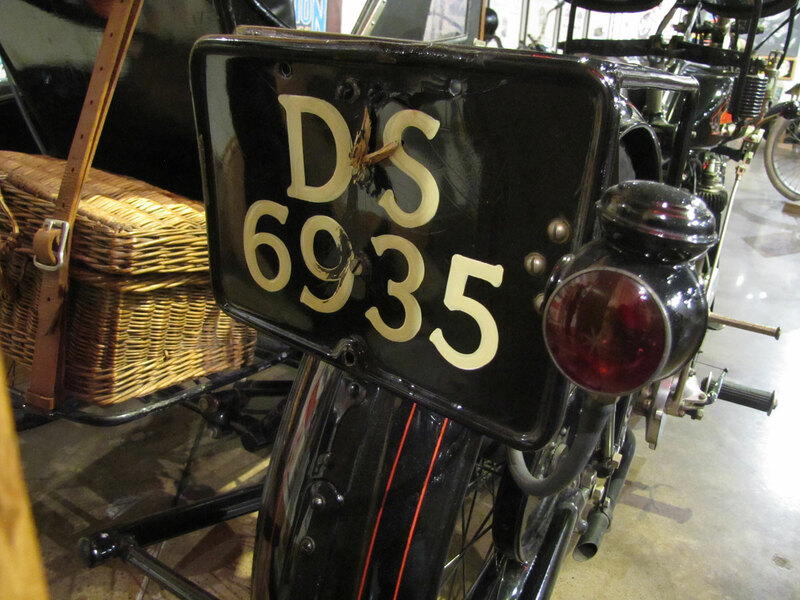 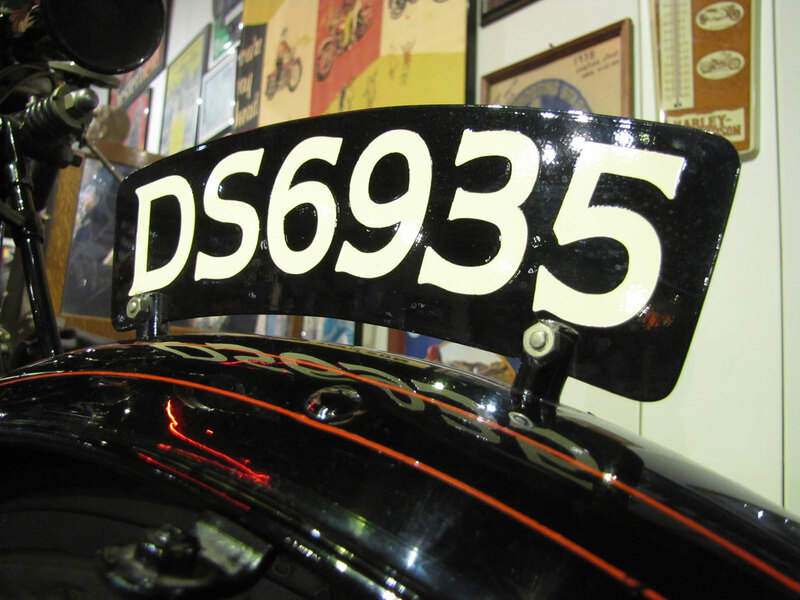 When you visit the National Motorcycle Museum you’ll get to view about 50 years’ history of sidecar desigs from a variety of manufacturers. 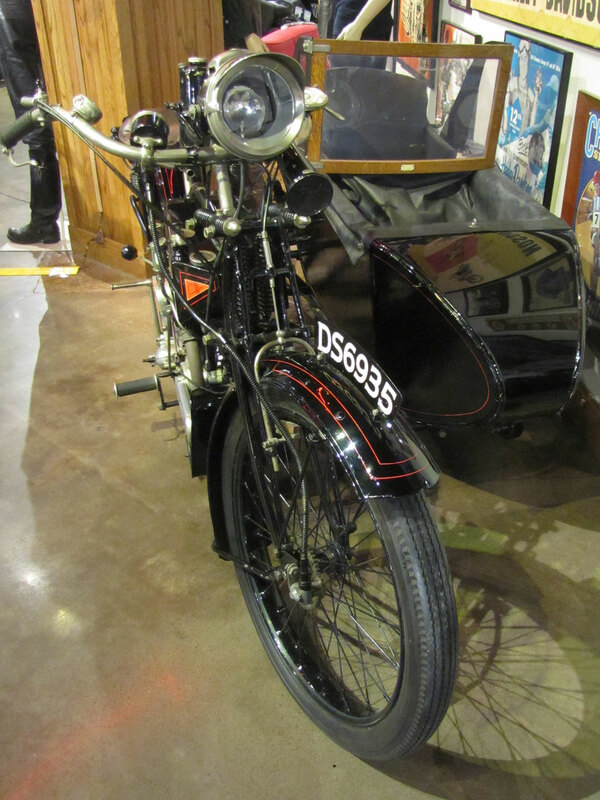 Beautiful Brit scooter. 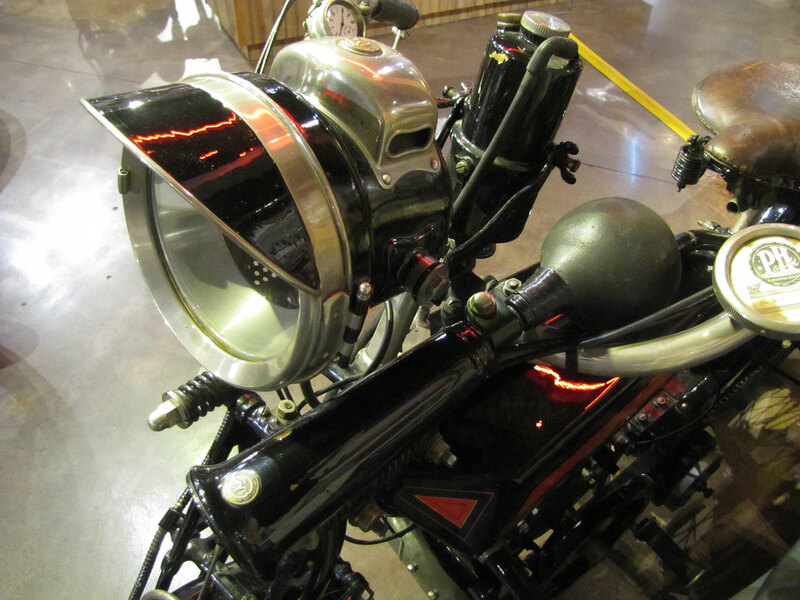 Been riding over 50 years and getting close to adding a side car. 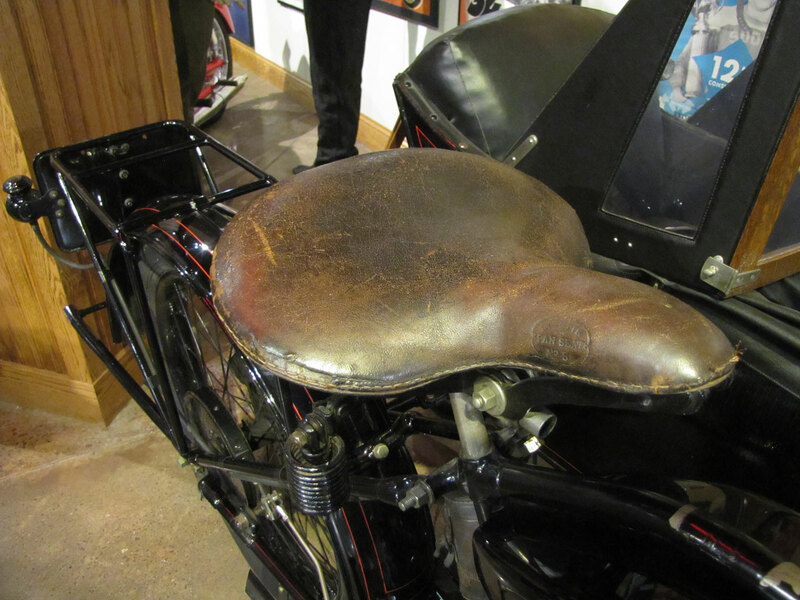 As a penalty for such a dumb suggestion, Wooten should be made to sit, Clockwork Orange style, through the unedited version of Blazing Saddles 15 times.